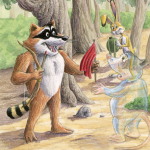 In The Cave Monster, readers are introduced to a magical wonder of nature that becomes its own character in the book. I am talking about caves. 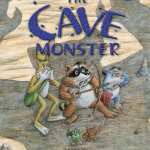 In the Cave Monster L. Joe Bean has been captured by the Cave Monster and Whistle-Toe, the rabbit, begs Lima Bear to help rescue him. The friends are scared of the cave monster and the cave but they want to help their friend. They enter the cave. What is a cave and how does it form? Wikipedia tells us that a cave “is a hollow place in the ground especially a natural underground space large enough for a human to enter. Caves form naturally by the weathering of rock and often extend deep underground.” Speleology is the scientific study of caves and their surrounding environments. We love words and we think the word Speleology (spa·le·ol·o·gy) pretty cool. There is so much to learn about caves. ** Stalactites, (which are beautifully illustrated in the Cave Monster,) are created by the continuous dripping of mineral rich water, which little by little leaves mineral deposits on the ceiling as the minerals harden. ** Stalagmites are created as the mineral rich water droplets fall to the cave floor leaving mineral deposits that grow to become pillar-like formations. ** Stalactites and stalagmites can eventually join from floor-to-ceiling, however they grow very slowly, around an inch every 100 years. **The deepest known cave is Voronya Cave in Georgia, at 2,197 m (7,208 ft). Cave are unquestioningly dark. Dark can mean spooky. You do not know what is behind every turn in a cave. There is no light to see your way out. At the same time caves are also super interesting. They are different from the outside world. They are cool and calm and decorated with rock formations and truly show the power of nature. Plus, living creatures do call caves their homes. Can you or your child guess what animals are most commonly found in caves? Nope, it is not cave monsters but spiders, salamanders, bats and fish. Are you tempted to visit a cave? We found a cool site where you can type in your state and locate a cave near you. It is called, you might have guessed it, CaveSearch.com. 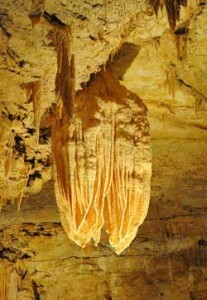 If you do visit a cave, send along your pictures and we will post them on our site and Facebook page! We’ll send out 2 copies of The Cave Monster to participants at random. Send your pictures to lbp@limabearpress.com. 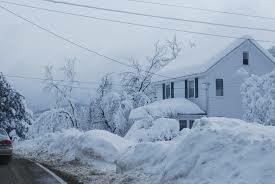 This winter try something different with your children to cure the winter blues. Instead of simply reading to them from the books on their shelf, why not come up with your own story? Storytelling is a time-honored tradition, handed down from generation to generation. In some cases, handed-down stories turn into beautifully written-down tales, decades later as in case of the Lima Bear Stories. You too, can create stories either on your own or with the help of your family. The result will not only be entertaining but a source of family memories as palpable as any family vacation photo album. Do not be intimidated; anything you have to share is going to be interesting to your children. Use what is important to you. If you are super clean, for example, create a character who learns the hard way why cleaning up is important. Create catchy character names. Catchy names make the story come alive and easily remembered. Another way to create terrific tales is to let the story unravel by having your family add the content along with you. For example, why not turn the television off on a cold winter’s night and simply start a story much like the old children’s game “whisper down the lane?” Start with a funny scene using material that is obvious to you. Let each family member add to the story and take the story over for a while. Enjoy as you witness the creative juices flowing. Each family member gets a chance to add and embellish until finally a completed story is created. After you get to the end of the story see if family members can repeat the story back. Did the story change? Try the story again using the new embellishments to see if the changes may become permanent changes. Is a holiday near or around a corner? Make your story a holiday tale. Put a twist on a famous fairy tale. If the writers of Shrek and Enchanted can do it, you can too! Use a topic from the news. A young hero story, for example. A famous writer instructor once said “write what you know,” in this case, “tell what you know.” Use what interests you: a football story, a yoga story, a story about your favorite animal, etc. Tell a story based, loosely or closely on a relative who your children may have never met – what a wonderful way to teach them about someone special who is actually a part of them. No matter what you decided to base your story on or how you choose to create it, remember that by storytelling you are sharing not only time with your child but a part of yourself. Enjoy making your very own story-telling memories! Let us know your successes! Reading to Your Child Is Fantastic But Do You Know Why? We know that you intuitively know that reading to your child is a good thing. Here at Lima Bear Press we love to share ideas for HOW to read interactively with your child, thereby increasing the learning. 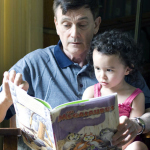 But do you know the reasons WHY reading aloud to your child is so important? The United Through Reading organization outlines a few of the many benefits of reading aloud to your child. We know that YOU did not need a reason to read with your child but it nice to know the wonderful benefits that can result when you do. One of the most intriguing benefits to reading aloud to your child is the building of self-esteem. It makes sense, though, that a child’s self-esteem can be increased when a parent reads a loud to him. Think about it for a second. Not only is the child learning vocabulary and language skills, he is also recognizing that time spent with him is time well spent. How powerful is that? She learns about behaviors and how to respond to situations which can be a huge ego boost to a youngster in social situations. He is armed with new skills that he can pull out and use at will. Can you think of more way a child’s self-esteem may be increased? The key to learning while reading is to include your child in the reading process. You are not simply reading to your child, you are reading with your child. Enjoy watching your child’s excitement as he/she figures out the answers to your questions. For example, after reading the whole book through one time, go back a re-read the book, asking your child to reason out how a picture on the page relates to the story. On the very first page of How Back-Back Got His Name, Lima Bear is shown asleep with a candle next to his bed. The wax has dripped down the sides of his end table (a thimble – too cute, I know). You could ask your child, “why do you think the candle wax is drooping?” Could it be that before it was blown out that it was burning for a long time? While you are talking about candles, why not create a little project where you both research how the first candles were made. You could try to make your own candle or visit a candle making shop. See how easy it is? We’ve read just one page of one book and we’ve come up with several great questions and activities already! You can do it too! “Extend the learning” pages, found in the back of each Lima Bear Book, are available to give you a jump start! Interactive reading ideas are also for you in the back of each book. 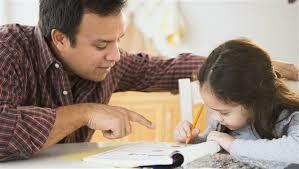 With a little practice, you and your child will be coming up with your own great ideas for additional learning. Feel free to share your own tricks to help your child learn as he reads. Reading a book to your child is a great way to help your child to learn. Sometimes, though, simply reading the words on the page may not be stimulating enough for your little one. Sometimes your child might be perfectly content to sit and listen but on other days, he may not be able to keep one foot still! Do not fret. Your child can still learn and keep his energy at a high level, too. The trick is to read to your child interactively. Point to some of the pictures on the page and see if your child can describe what the illustrations are. In How Back-Back Got His Name, for example, the 1st page has some terrific illustrations. You could ask, “Why do YOU think the dime in the picture is so big?” If stumped, you could point out to your child that maybe the dime is so big because Lima Bear is so small? Are you getting a sense for how easy reading interactively can be? If you are ever stuck, remember that in The Lima Bear Series, interactive reading ideas have been provided for you in the back of each book to get you started. “Extend the learning” pages ideas are available to give you a jump start! We will have more ideas for you as well in the next post. Please share any interactive ideas that have worked for you and your child as well.